This expanded issue of Avalon Rising intends to educate, entertain and breathe life into the current ‘Earth Mysteries’ renaissance. For too long, this type of information has been kept in the minds of stuffy professors, leyhunters or Freemasons. 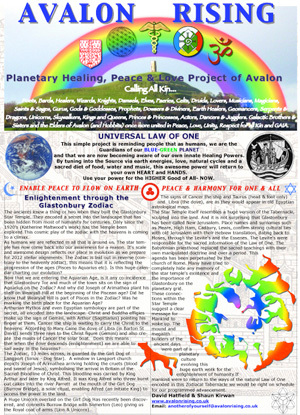 From stone circle discoveries on remote Islands, to fractal grail physics, to stunning discoveries in the landscape of Avalon, we are on the verge of reconnecting to the sacred landscape that our ancestors enchanted. Our 2007 ‘Summer of Love’ edition is a 16 page magazine on Earth Mysteries, Consciousness and Ancient Knowledge with top authors and mystics writing original articles. 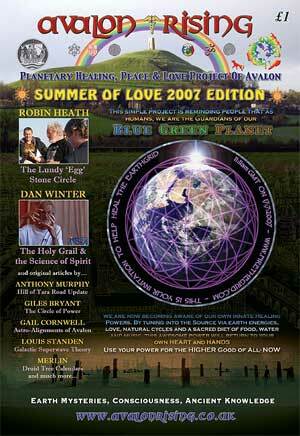 Dedicated to the current Earth Mysteries renaissance that last peaked in the summer of Love 1967. Eight double sided A5 pages (Not in original print order). Please feel free to distribute this issue as is. We request that no profit is made from this work and that permission is asked for any material to be used in other publications or websites. 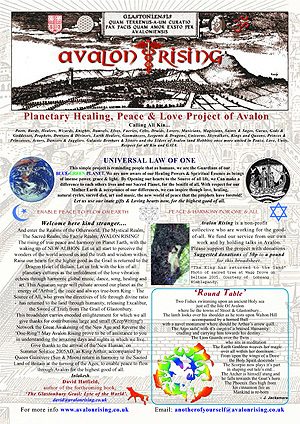 Thanks, on behalf of Avalon Rising team/contributors. Four A4 pages and One central A2 poster page.